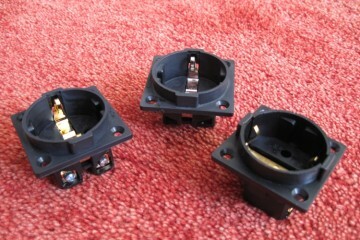 Power cables are often placed in one of two camps: rich and relaxed or cool and clean. The Stream, however, combines a silky smooth sound with excellent speed and transparency. Cable Length. It’s a subject that is often discussed and no one seems to agree. There are manufacturers that have suggested the optimum length is 1.5m in or 1.8m, and personally, I also have some ideas about the subject. BlackRhodium decided to find out for themselves what sounds best and so they proceeded trying various lengths of their cable and finally narrowed it down to 1.7 meters. Their Stream power cable is available in longer lengths, but obviously, the advice is to go with 1.7 meters. Interestingly enough I did not have to take their word for it but was able to directly compare the Stream power cable in two lengths: 1.7 m and 2.0 m. Apart from the specific length there is quite a list of buzz-words describing the attributes of these cables on the manufacturer’s website that I won’t all repeat here because I care more about cable’s sound than its specs but the most noteworthy include “Low Loss Silicone Rubber Insulation”, “High-quality silver plated copper conductors” and “RFI noise reduction technology including tightly braided metal screen”. 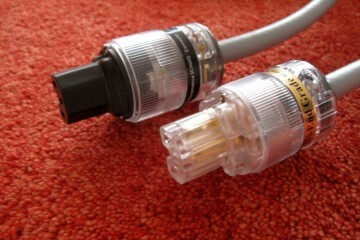 Both ends of the cable are terminated with optional Rhodium-plated Black Rhodium branded connectors. For assessing this cable’s sound, I used my regular reference setup as well as something completely different: the Plato Class A+ all in one music server. 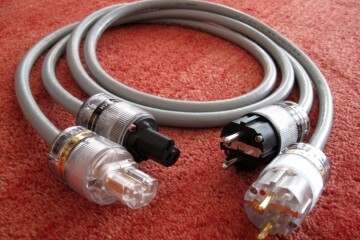 Before starting the reviewing, both cables were used continuously for a couple of days and when comparing to other cables, this was always with the same polarity and in the same outlet of the extension block. 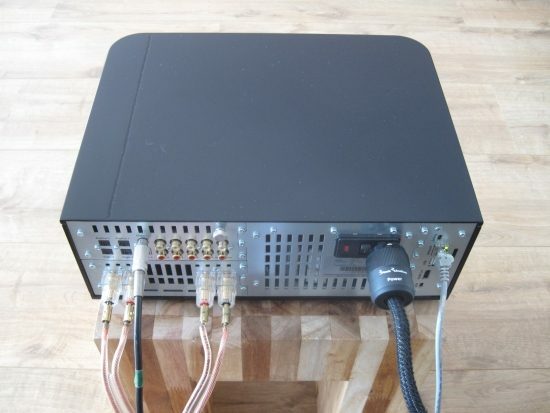 The Plato is visiting for another review but comes in handy here too because with a single power cable I am in effect affecting many different internal components: a streamer, a preamp, a custom-made computer system and a power amp. 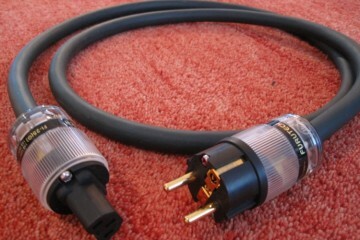 To a large extent, this eliminates influences from other cables and components, other than from them being connected to the same extension block. With only one cable for an entire system, surely any differences in cable sound should be very easily discernable. 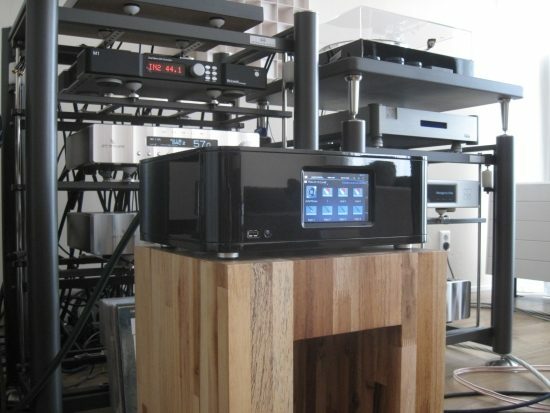 Speakers used with the Plato are the affordable but nicely open and spritely Dali Ikon 6 and the more tricky to drive yet eminently capable Apogee Centaur. First connected with a Belden 19364 powercord with Oyaide 004 connector, the Plato sounds already pretty good, much better in fact than you’d expect from an all in one system. It drives both speakers with ease, even the Centaurs, which did surprise me. 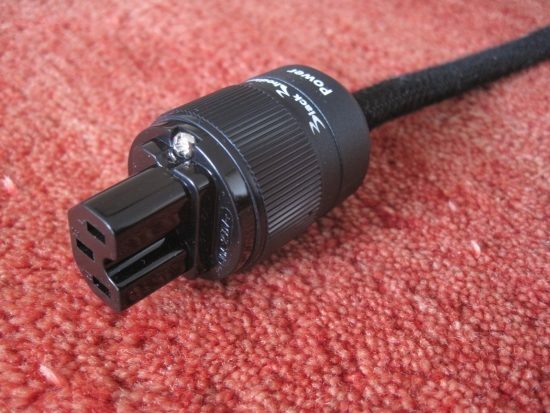 The Belden is a very affordable and simple power cable with an essentially neutral sound. 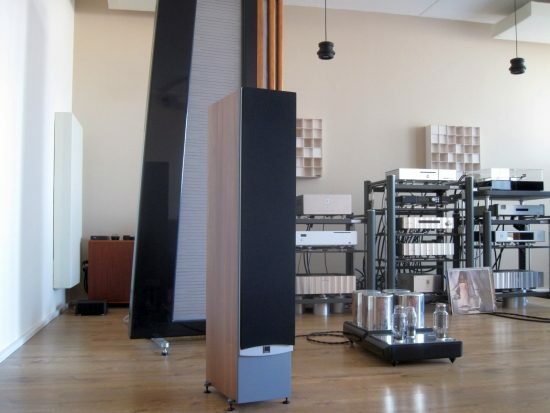 It can lend a lean or bright touch when the system’s sound already tends in that direction, but normally it allows for excellent speed and dynamics and it does not normally stand in the way of a proper music reproduction. Substituting the Belden for the Black Rhodium Stream, the first thing that stands out is that the sound is now more precisely focused. There’s a better delineation of images in the soundstage and voices stand more precisely smack in the middle between the speakers. Normally such precision comes at the expense of richness of tonality but there’s no leanness here whatsoever. Everything is there, but there are no sharp edges and noise (inasmuch as this is even audible) seems to be lower, judging from the calmness that emanates from the music. Continuing the trend of unexpected synergy is the Stream’s bass, which is more organic and richer than the Belden’s, yet still highly articulate and quite punchy as well. The midrange again has an interesting combination of warmth and detail, and is nicely open, although more nurtured than the more rough ‘n ready Belden. The Centaurs are known to be capable of ear-piercing treble if ill-combined but with this cable, they are definitely very well behaved. This is an important aspect, as this effect can also be achieved by using cables that sound shut in or rolled off in the treble, but this is definitely not the case here. With the Stream, treble is considerably more airy and gentle and more natural yet every bit as open and extended. 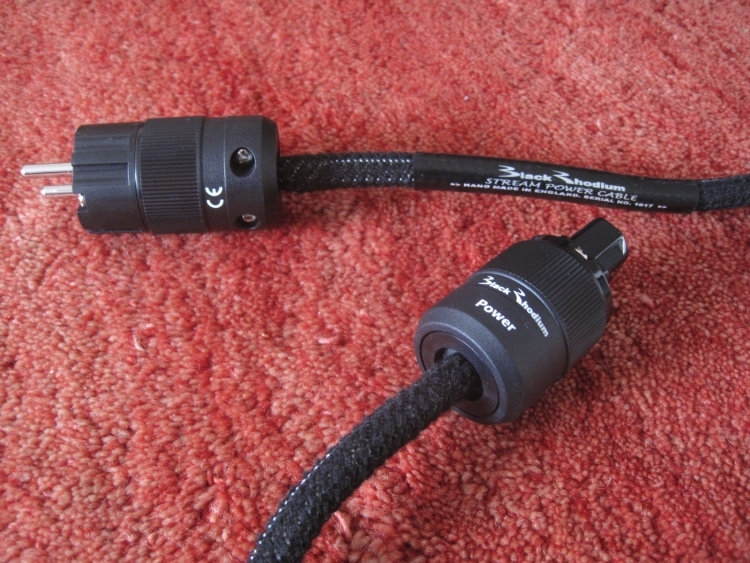 This cable may well have the nicest treble I’ve heard from a power cable yet. 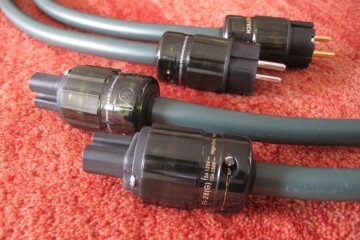 Time to swap to another cable, this time one more in the same price category as the Black Rhodium. 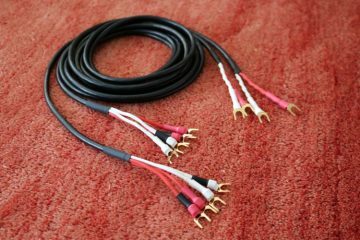 The Gigawatt LC2 MK3 is a very neutral and clean sounding cable, but it is not universally applicable, and in my experience works best with components that are less susceptible to cable influences such as music servers and CD transports. While it could be argued that these components should not benefit from higher end cables at all, I’d counter that the influence on the other components connected with other cables in the extension block should not be underestimated, especially in complex systems with many components. 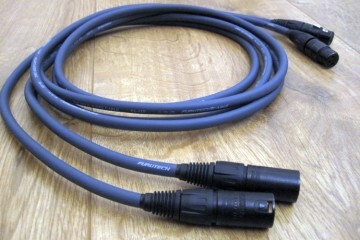 In my existing situation I successfully use two full sounding cables (Furutech Alpha and FP-TCS31), but when I use more of the same cables in the same block, all components start to sound overly smooth, not only those actually connected with these cables. The Stream has a similar effect on the other components, but as with the Furutech, one or two works very well. As always in audio, it’s about balance and the trick is to not overdo it one way or another. Very clean sounding cables such as Belden and the Gigawatt do not have the aforementioned smoothing effect on the system, but then they don’t sound very pleasing in the first place either. When connected to the Plato, as expected the Gigawatt has more distinct transients and sounds more immediate. Quite unexpected however is that it does not quite have the precise imaging of the Black Rhodium Stream. The Gigawatt also has a leaner tonality and is very direct, to the point of being incisive. The Centaurs’ forward treble is definitely not being ameliorated with this cable. With such clear-cut sound, you’d expect it to sound very detailed too, but I don’t hear it that way, rather the opposite. The current model Furutech FP-TCS31 with Furutech FI-28R connectors presents what could be considered the reverse of the Gigawatt: very smooth and relaxed and with a very full tonality. 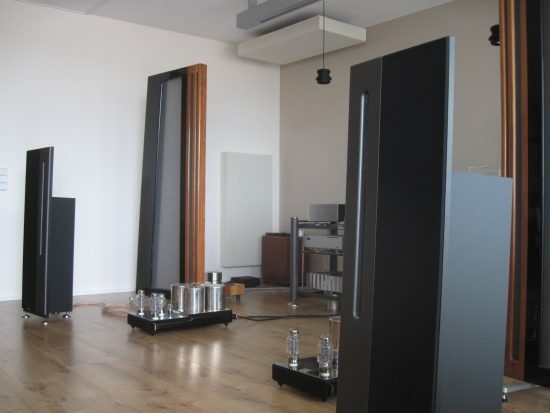 The Furutech also has an impressively large soundstage and very nicely fluid treble. Af first listen these descriptors could read as being equally applicable to the Black Rhodium and in direct comparison, most of them do indeed, but with a few important differences. The Stream takes the Furutech’s rich and relaxed character and adds more transparency, more refinement, more agility and snappier transients. Although the results are pretty clear using the Plato, it is always good to try another setup to rule out misfits or special synergies. 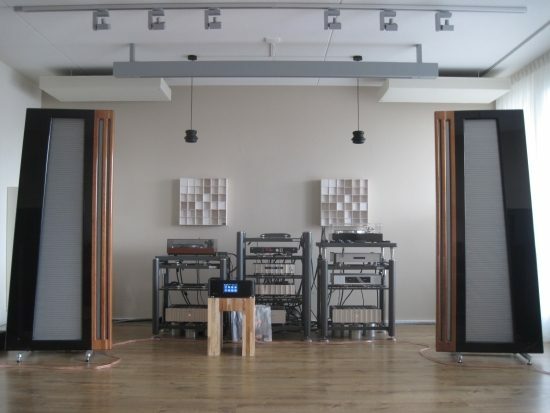 Thankfully, the listening tests using the Bricasti M1 DAC and the rest of my reference system only go to confirm the results obtained earlier using the Plato. In this context, the Furutech FP-TCS31 with Furutech FI-28R connectors makes for a less ideal match in terms of speed and dynamics but it arguably provides the richest and most relaxed sound. The Black Rhodium Stream, by comparison, is easily the most refined and most well-balanced of the bunch, providing even better fine detail than the Furutech while retaining fluidity and having considerably better PRAT. 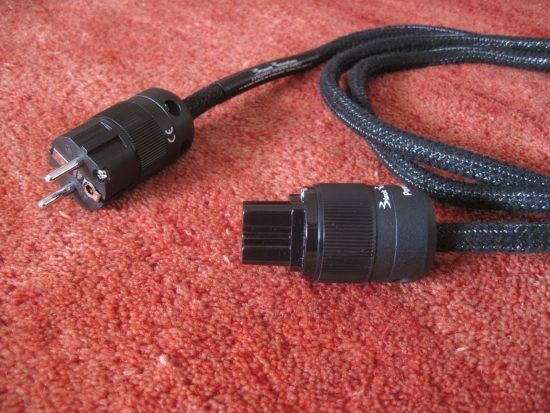 With the Bricasti M1 DAC so far I have preferred the older Furutech Alpha 3 cable with the current FI-28G connectors, as this combines the powerful, sonorous sound of the older Alpha cable with the refined magic of the newer connectors. The Stream, however, counters with strong competition. It may not be quite as sonorous and powerful in the midbass and lower midrange, but it sounds more transparent and even more refined. While I am known to appreciate some extra power in the midbass as it lends a fuller timbre to my planar speakers, another perspective might be that this is actually coloration added where it should not be and I would not disagree. These days, as I more and more “neutralize” the sound of my system, I am more and more appreciating cleaner sounding components and cables. In this context, the Black Rhodium could be considered something of a hybrid, combining the best aspects of two typical opposites: it sounds creamy rich yet fast and articulate. As always, cable sound and the effect of cable length is a matter of interpretation and system matching. In my experience in general, the longer a cable is, the more you hear its inherent “sound”, as presumably created by the insulation/jacket capacitance and its geometric attributes. Often this means that the sound becomes more relaxed with an increase in length. Now, this is certainly not always the case, and I don’t assume that this also applies to the Black Rhodium cables. They may well apply a procedure that I have no knowledge of, but the listening comparisons seem to support this theory. After having been powering the system for several days I have compared both cables extensively, using the same position in the extension block and naturally with the same phase. I assessed the sound immediately after swapping from one to the other and confirmed by swapping back a couple of days later to make sure that each cable was in a rested position and run in. In each case the results were consistent. One thing to take into account is that I noticed a slow development in sound with both Stream cables where they would become less controlled and smoother the longer they are used. So while at first, the midrange sounds slightly forward (in a pleasant way), the cables soon develop more richness and become more relaxed. The 1.7m Stream cable sounds tighter, more controlled and more focused with a tightly locked center image. This is a very well balanced sound and highly refined with just the right amount of bite. The 2.0m Stream cable sounds more spacious at first and even more relaxed but is less articulate overall, less well defined in the bass and less precise in terms of imaging. Swapping back to the 1.7 indeed it seems obvious why they have chosen this length. Cable lengths matter! I would say that the difference between 1.7 and 2.0 is not as big as between two cables from different brands at opposing ends of the audio spectrum because there is a strong family resemblance between the two, but it is certainly easily audible. 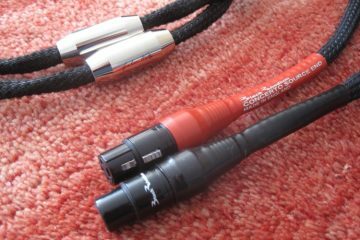 This cable presents an interesting combination of talents: it sounds precise and controlled yet smooth and velvety rich. In spite of its excellent transparency, this cable is absolutely not cool or dry. The Stream is every bit as open and detailed as the other cables, but it presents its skills in a gently refined, nurtured manner. The Stream will not impress with eye-watering attack, but seduces with its suave sound and encouranges long listening sessions without listening fatigue.